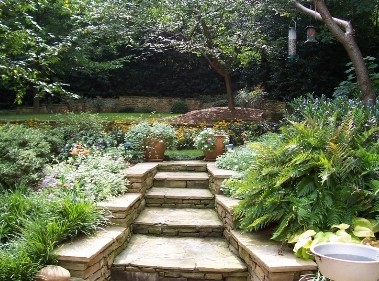 Paving stones can add warmth to your backyard landscape and make for a more inviting atmosphere. Whether a whimsical garden walkway, or a stairway carved into the earth with unique landscaping, paving stones do just as their name suggests and help to pave the way! At Hutcheson Horticultural Company in Woodstock, GA we understand that many of our business and residential clients live along ridgelines. This is especially true for those that have full daylight and walkout basements. The lay of the land lends itself to a full daylight basement, but what about the outside geography that results? How does one easily access a basement entry without toppling down a steep incline? The answer is in a custom designed and installed hardscaped stairway! No longer will you struggle up or downhill, instead you’ll enjoy an easily managed climb or descent on beautiful paver stones. Whether you are looking for a sweet garden retreat walkway, or a patio that will add extra living space outside, Hutcheson can take care of this for you! From custom design, to custom install, we are there each step of the way to make sure that your vision becomes a reality. Contact Hutcheson Horiticultural Company today for all of your Cherokee County landscaping and hardscaping design and installation needs. Make sure to keep up with us on Facebook, Twitter, and Google + for landscaping tips and suggestions that will make a difference in your North Georgia landscape!